The fully restored high altar after hundreds of hours of hard work. It looks magnificent and glorious. It lifts the heart to worship and praise the Lord. 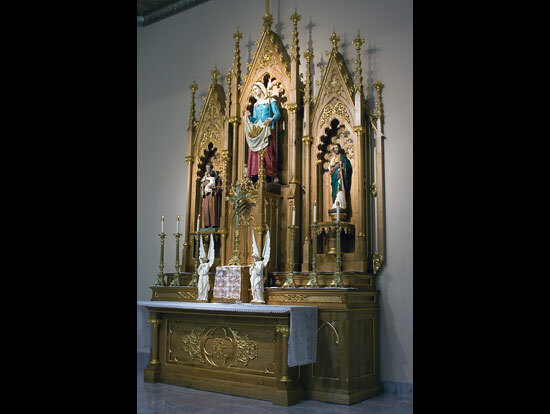 Parishioners attend Mass for the blessing and reinstallation of the old St. Genevieve’s high altar in a historic date of August 27, 2009. Father Ricardo feels satisfaction and joy to see the project complete. But what new project is he thinking of now? Bishop Ricardo Ramirez incenses the high altar at the beginning of the celebration of the Eucharist. Altar servers participate in the solemn ceremony. Rosemary Leyva, head of the St. Genevieve’s Historical Society, proclaims one of the readings from Holy Scripture. The gifts are presented by the Romero Family. The Eucharistic Liturgy is presided by Bishop Ramirez. Deacon Bill Karrenberg proclaims the Gospel and assists at the altar. Concelebrant priests from left to right: Rev. Juan Moreno, Rev. Ronald Burke, Msgr. Robert Getz, Rev. Ben Mones, and Rev. Ricardo Bauza. The Diocesan Choir and the congregation during the prayer of The Our Father. These statues are adoring angels. They come from the old church and used to be on the high altar decades ago. Now they are reestablished next to the tabernacle to remind us of the heavenly host adoring Jesus Christ. The Piro-Manso-Tiwa Tribe are present for this special occasion. Bishop Ramirez blesses the congregation, the people of God. These are many of the volunteers who worked on the altar. They pose with Bishop Ramirez for a historical picture.